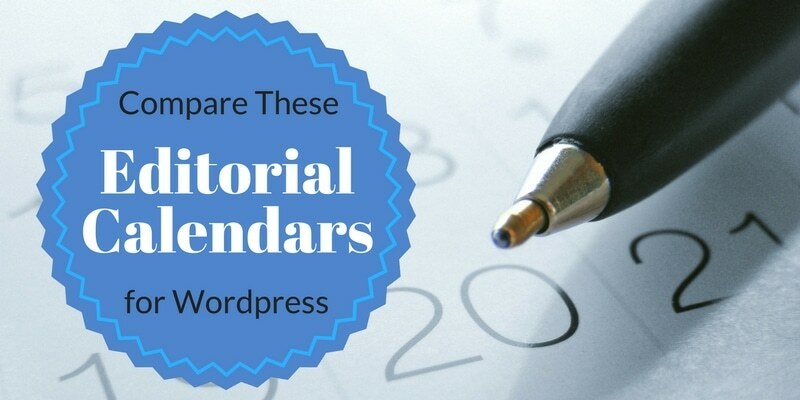 Editorial Calendar Plugins for WordPress – Get Your Content Organized! Posting consistently to your blog and social accounts is no easy task, but with one of the following editorial calendar plugins for WordPress, the task becomes way easier and even fun! WordPress editorial calendar plugins come in free and paid versions, depending on the features included. If you only need bare bones planning, then a free version may serve your purposes. If you’d rather work with a more attractive interface and more comprehensive features… then the premium plugins may be your choice. The Editorial Calendar Plugin offers you a simple to use visual overview of your content and blog posts. When installed and activated, it will present a Calendar menu option below the “Posts” tab in WordPress. You do not need to configure any setting or fiddle with any option. You can immediately start using it. New posts can be created by simply hovering to any date on the calendar then click New Post. It has a Quick Edit popup that allows adding post titles, more content, publish time as well as status in the calendar. Posts are created as drafts by default. It has a drag-and-drop interface to easily manage post dates. There are also View and Edit links that are directly linked to the permalink of the post and edit screen. If you are a group of collaborators or a solo blogger, Editorial Calendar is a great editorial content calendar plugin that is FREE and easy to manage for your blog schedules. Nelio Content is considered by many as their own personal content assistant. Nelio Content is one of the most popular WordPress social media campaign calendar plugins with a content assistant and editorial calendar. Whether you are a professional editor or a casual blogger, using an editorial calendar plugin such as Nelio Content will make your job easier, thus you can immediately become an awesome blogger or editor. Nelio Content can save you time and keep your scheduling on track. Try it today to streamline your content marketing. CoSchedule is a premium social media campaign calendar that lets you schedule social media, team tasks, blog posts, and everything in your WordPress website. This WordPress plugin stands out as an editorial calendar plugin for its powerful features which raise the bar for other plugins on the market. CoSchedule sports a beautiful design and is perfect for practical use. Here, you are allowed to plan, promote, and publish your content directly from the dashboard of your WordPress site. What is great about CoSchedule is that it enables you to share your own content together with curated content on several social networks like Facebook, LinkedIn, Pinterest, Twitter, and Google+. There is no need for you to log into many accounts and post separately because it is an all-in-one social media calendar. With CoSchedule, you can assign tasks to your team including notes on projects, send email notifications automatically, and set deadlines in publishing content. This is an effective tool for evaluating holes to be filled in your content publishing. CoSchedule features a headline analyzer that rates and analyzes the strength of headlines before you publish them. The score will say if the headline is common or uncommon, if it is emotional, and if it is powerful. CoSchedule helps you understand the use of other tools and software that can make your job easier especially for content creation. It allows you to combine other tools with its features. Include one of these editorial calendar plugins in your toolbox to create a fantastic all-in-one publishing headquarters right within your WordPress dashboard!